On Thursday the 26th of May Geoffrey Wonnacot gives an 1-day workshop in Ursem. 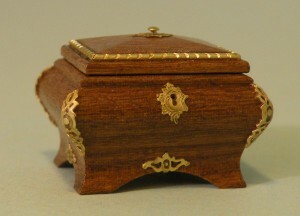 A small but elegant casket in the style of Sir Lodewijk the fifteenth. 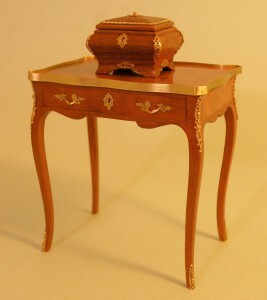 The casket is just 23mm wide and can be used on a desk or as jewel box. Partly prefinished wood and metals parts will be used as materials for the casket. The inside will be made from silk. It is possible to make the gasket during the one day workshop. But afterwards you will also receive a instruction to finish the casket at home. De workshop includes lunch, coffee and tea. A interesting workshop to create a 18th century writing table. Made in the style of Lodewijk XV, ascribed to Pierre Langlois. We will work with prefinished wood and veneered components. The workshop includes lunch, coffee and tea. 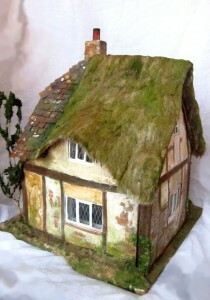 The cottage, scale 1:24, will be made in 2016. Sizes: 30cm height, 22 x 26 cm is the surface. The interior isn't made at this workshop. But Penny will add lightning to the materials. You can bring your own pieces of wood and stones to give your creation a personal touch. This is an exciting workshop. Cora, Tine and Trees will give a short workshop of maximum 2 hours each. Three disciplines in 1 workshop. The components will be added together at the end of the day. Location: Vlaardingen (NL) or Ursem (NL). This lovely door fits in the context of the earlier workshops about doors and a room with balcony. 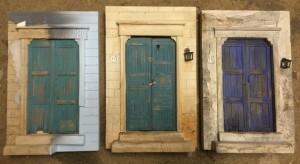 Lots of information and tips from a expert miniature builder. The workshop includes lunch, coffee and thee. The second part from the workshop of Jens Torp. Jens has cast the molds in silver. Now it is time to engrave, polish, and solder. Enough to be busy with for 3 days. 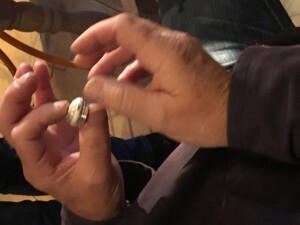 It is possible to attend to the second workshop without making the mold. Extra costs may be involved. Penny is coming to Ursem for a one day course. 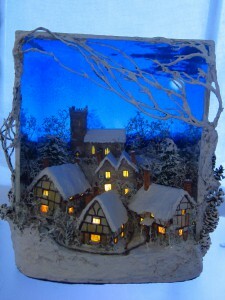 The winter scene will be made in 1 day only. Penny will bring all the material. 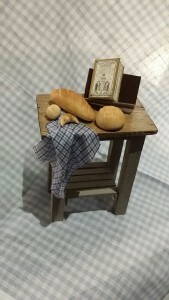 Also material for the outside of the scene. The workshop is including lunch, coffee and tea.